Sub-Saharan Africa (SSA) is the portion of Africa located south of the Sahara Desert. It comprises most of the African continent and is home to the majority of Africa’s population. Unfortunately, despite SSA’s bounty of natural and human resources, the region is facing an ever-worsening food-security crisis largely due to stagnant and, in many cases, declining agricultural productivity combined with rapid unchecked population growth. The result has been widespread and endemic malnutrition, hunger and poverty, and the severe degradation of the region’s environment. Confronted by these problems and more, SSA faces a bleak future of starvation and social collapse if traditional rainfed subsistence farming continues to be the dominant agricultural production system employed by the region’s farmers. Traditional rainfed agriculture is practiced on 95% of the land currently being cultivated in SSA. 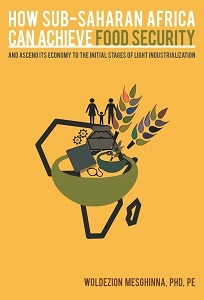 It is in this context that this book, in an effort to help SSA countries, provides a comprehensive guide to science-engineering-based principles and methods that, if broadly implemented in conjunction with supporting government public policies and programs, could substantially and sustainably increase their domestic food production and associated improvements in living standards, reduce poverty, and foster multi-sector economic growth critical to the region’s eventual ascension to industrialization. Dr. Woldezion Mesghinna is an Eritrean American who immigrated to the United States in the 1970s. He attended Cornell University, where he received his Bachelor of Science and Master of Engineering degrees in civil engineering, and later attended Utah State University, where he received his PhD in agricultural engineering, with a primary focus in irrigation and drainage engineering. Dr. Mesghinna is a registered professional engineer in California, Colorado, Wyoming, Arizona, New Mexico, and Utah, and has testified extensively as an expert witness on water rights cases in the United States. He is the principal engineer and president of Natural Resources Consulting Engineers, Inc. (NRCE), which he founded in 1989. NRCE is a civil, environmental, agricultural, and water resources engineering firm that provides consulting engineering services in a wide variety of areas both domestically and abroad. Dr. Mesghinna has simultaneously managed the implementation of complex multipurpose water resources project developments in Africa, in the United States, and especially for Native American tribes. Dr. Mesghinna is fluent in English, Tigrigna, and Amharic.